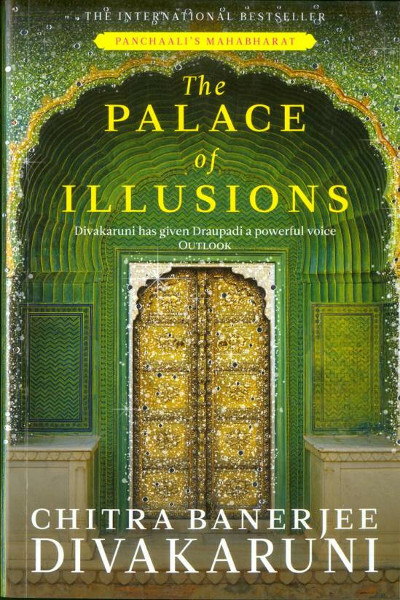 The Palace Of Illusions, written by Chitra Divakaruni, is a tale of honor and humiliation, love and passion, kings and queens, featuring the epic story of the Mahabharata, but from a female perspective. The Palace Of Illusions is a modern retelling of the epic Mahabharata, through the eyes of Panchaali (Draupadi), the wife of the famous Pandava brothers. Divakaruni has rewritten this epic from a female perspective. The focus of the story has shifted from the original war and honour, to more humanistic concerns. It is an epic saga, surrounding the events of Panchali’s life, while growing up in a male dominated world. The Mahabharata is a narrative about the Kurukshetra war between two families, the Pandavas and the Kauravas. Panchali is the protagonist of Divakaruni’s story. She is a young girl born out of a special fire ritual that was performed by her father, King Drupada. Right from the start, she leads a lonely and unusual life, without the care of a mother. Her sole companion is her brother, Dhristadhyumna, who was also born out of fire. Panchaali is characterized as an atypical female as she is a woman who is outspoken, self confident, and defiant. She is also interested in the art of warfare and the politics of monarchy. Her life changes when she falls in love and ends up married to all the five Pandava brothers. As a result of unfortunate circumstances, she ends up living as a servant, and watches her family suffer through a terrible turn of events. The story explores different areas of Panchaali’s life, such as her husbands’ fight to regain their kingdom, and her intriguing friendship with Lord Krishna. Things become more complicated when she is attracted to Karna, a fierce and noble warrior, who is also the Pandavas’ enemy. The Palace Of Illusions is a woman’s struggle for survival in a man’s world. This book was published in 2009 by Pan Macmillan India. Chitra Banerjee Divakaruni is a poet, author, and professor of writing at the University of Houston. Her writing repertoire covers numerous genres. Some of her published titles are Black Candle, Leaving Yuba City, The Brotherhood Of The Conch, and Shadowland. Apart from writing, Divakaruni is the former president of Maitri, a helpline geared for South Asian women who are experiencing domestic abuse. She is also a board member of Pratham, a non profit organization which tries to bring literacy to underprivileged Indian children. Divakaruni is married to Murthy, and lives in Houston, Texas, with their two sons. This book will be shipped in 2 days’ time. The time taken for you to receive the book after it is shipped will depend upon the mode you choose, while completing your purchase. The rates applicable for each mode are different. You will be informed after the order is shipped. Shipping costs depend on the mode chosen, the weight of the item, and the distance it will travel to reach its destination. Shipping costs will be charged depending on the weight of the entire purchase (if more than one book is purchased). The same shipping mode will apply to all products in such a case.